Folio 32v shows Christ enthroned. 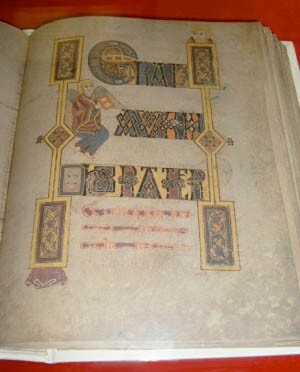 Almost all the folios of the Book of Kells contain small illuminations like this decorated initial. Folio 19 contains the beginning of the Breves causae of Luke. 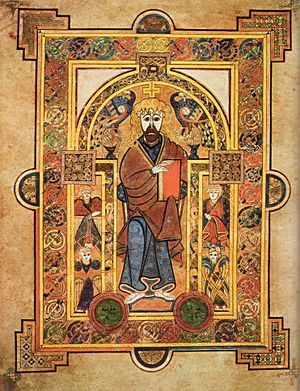 The Book of Kells is an illuminated manuscript in Latin of the four Gospels of the New Testament together with some extra texts and tables. It was created by Celtic monks about 800 AD or slightly earlier. The text of the Gospels is mostly taken from the Vulgate bible, and it has several passages from earlier versions of the Bible, such as the Vetus Latina. It is a masterwork of Western calligraphy. and Ireland's finest national treasure. The illustrations and ornamentation of the Book of Kells are outstanding. The decoration combines traditional Christian iconography with the ornate swirling motifs typical of the art of the British Isles. Figures of humans, animals and mythical beasts, and Celtic knots and interlacing patterns in vibrant colours, enliven the manuscript's pages. Many of these minor decorative elements have Christian symbolism. The manuscript today is 340 folios (separate sheets, written on one side). Since 1953, it been bound in four volumes. The leaves are on high-quality calf vellum. There are ten full-page illustrations, and text pages that are vibrant with decorated initials and interlinear miniatures. The writing of the text itself appears to be the work of at least three different scribes. The colours used were got from many substances, some of which were imports from distant lands. The manuscript takes its name from the Abbey of Kells which was its home for centuries. Today, it is on permanent display at the library of Trinity College, Dublin. The library usually displays two of the four volumes at a time, one showing a major illustration and the other showing a typical text page. 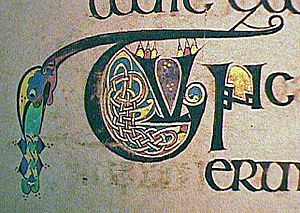 In 1951, the Swiss publisher Urs Graf Verlag Bern produced the first facsimile of the Book of Kells. Most of the pages were reproduced in black-and-white photographs, and the edition also had 48 colour reproductions, including all of the full-page decorations. Under licence from the Board of Trinity College Dublin, the art publishers Thames and Hudson produced a second facsimile edition in 1974. This edition had all the full-page illustrations in the manuscript and a section of text page ornamentation, with some enlarged details of the illustrations. The reproductions were all in full colour. By 1986, Swiss publisher Faksimile-Verlag had a process that used gentle suction to straighten a page so that it could be photographed without touching it. They got permission to publish a new facsimile. After each page was photographed, a single-page facsimile was prepared so the colours could be carefully compared to the original and adjustments made where necessary. The completed work was published in 1990 in a two-volume set containing the full facsimile and scholarly commentary. One copy is held by the Anglican Church in Kells, on the site of the original monastery. In 1994, Bernard Meehan, Keeper of Manuscripts at Trinity College Dublin, produced an introductory booklet on the Book of Kells, with 110 colour images of the manuscript. A digital copy of the manuscript was produced by Trinity College in 2006. 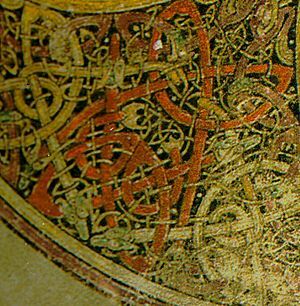 Faksimile-Verlag image of folio 32v "Christ Enthroned"
Folio 183r from the 1990 facsimile of the Book of Kells contains the text "Erat autem hora tertia" ("now it was the third hour"). Folio 291v contains a portrait of John the Evangelist. Folio 34r contains the Chi Rho monogram. Chi and rho are the first two letters of the word Christ in Greek. 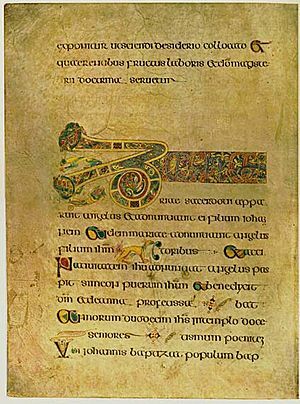 Folio 309r contains text from the Gospel of John written in Insular majuscule by the scribe known as Hand B.
Folio 2r of the Book of Kells contains one of the Eusebian Canons. Folio 7v contains an image of the Virgin and Child. This is the oldest extant image of the Virgin Mary in a Western manuscript. Book of Kells Facts for Kids. Kiddle Encyclopedia.